The best dentist deserves the best dental care. Find out what to consider when looking for a new dentist in the Park Slope area. When it comes to dental care, no one should settle for just any doctor. Second generation dentist, Dr. Frank J. Sapienza of the Dental Spa of New York, profiles what patients should look for when selecting a new dental care provider. Select a dental care provider with excellent undergraduate and dental school credentials. He or she should also value continuing education, keeping up-to-date on the latest diagnostic and treatment techniques modern dentistry provides. Additionally, both dentist and staff should take time to teach patients of all ages the best way to care for their teeth and gums at home. The Park Slope dentist must take the time to include patient input in all treatment plans. No dental care is more important than preventive dental care. Oral exams and cleanings, x-rays, oral cancer check-ups, and bite checks are just some of the services essential to optimizing oral health. Sealants, mouthguards and fluoride treatments protect teeth from injury, decay and complex dental work. Also, restorative and cosmetic techniques should be state of the art, giving patients a wide choice of how to replace missing teeth, restore cavities, whiten enamel and smooth and straighten less than perfect smiles. From simple smile makeovers to full mouth reconstruction, the best 11215 dentist possesses the knowledge and expertise to deliver totally refurbished looks, health and function. Plus, how does the dental office in Park Slope handles dental emergencies? Dentists and their staff must be available to address pressing concerns such as infection, sudden tooth loss, fractures and other immediate needs. An excellent dentist in the 11215 area teams with a friendly and knowledgeable staff that welcomes patients and creates an atmosphere of calm and relaxation. Blankets, soothing music, TVs–these “extras” calm the anxious patient. Additionally, the new dentist ensures a painless experience with local anesthesia and sedation options that make the most complex of procedures easy to tolerate. Chances are your best dentist is Dr. Frank J. Sapienza. A well-credentialed dentist of 30 years, this published author and dentist puts patient comfort and concerns first–as do his friendly, welcoming team. Whether your needs are essential preventive or restorative services, or you would like a totally new look for a smile that’s less than perfect, Dr. Sapienza can help. 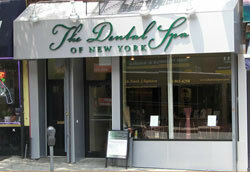 Contact his Park Slope dental office today for your own smile consultation. Find out for yourself how great dental care can be.